Vaults of Memory: Jewish and Christian Imagery in the Catacombs of Rome: An Exhibition, by Estelle Shohet Brettman, Boston: Thomas Todd Publishers, 1985. Paperback. This catalogue records a remarkable research project which traveled from Boston's Beacon Hill to the Castel Sant'Angelo in Rome. For approximately ten years, Estelle Shohet Brettman, Co-Founder and Executive Director of the International Catacomb Society, repeatedly explored the catacombs of Rome with a gas lamp and camera. 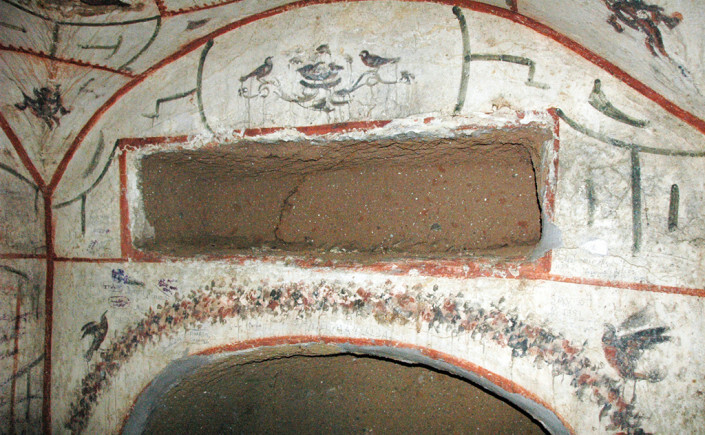 In the vestigial imagery and epigraphy of Subterranean Rome, she noted parallel symbolism among Jewish, Christian, and pagan burials. The exhibit it records is now digitized and available to view on the site, www.catacombsociety.org. Considerably more than just a listing of exhibit items, the catalogue takes the reader back in time and answers questions about ancient beliefs, art and customs. Some twenty photographs, many in color, show such views of catacomb art as "A Rousing Funerary Banquet," a "Biblical Superman," and a "Lesson in Anatomy," The book adds important dimensions to research on the catacombs and surely suggests future work in the field.